Honey shook her head, her eyes brimming with tears once again. "Daddy got just furious when Jim said that. He said that Jim needed to be shown a thing or two." Honey shrugged helplessly. "I don't know. After Daddy said that, he turned to me and said, 'You'd better get to the bus stop. Jim won't be going to school with you this morning.' He looked so angry, I didn't dare ask any questions. I-I just left." Trixie looked from Mart to Brian, seeking an explanation for what had happened. They looked as bewildered as she felt. Surely Mr Wheeler isn't planning to send Jim away just because Jim talked back to him, she thought, a panicky feeling pushing at her chest. When Trixie and Honey had first met Jim, he was a homeless runaway hiding from his cruel stepfather. It had taken the girls a long time to get him to trust them, and even longer to convince him that there were some grown-ups he could trust, too. The result of that trust had been a real home with the Wheelers, and his first close friendships with the other Bob-Whites. If this disagreement with his adoptive father destroyed that trust, it could destroy the home and the friendships as well. Trixie felt tears springing into her own eyes as she imagined Jim running away again. Although she denied it to the others, and even to herself, Jim was more than a friend to Trixie. He was someone very, very special. Temperatures run high and a town is divided by the proposed expansion of the International Pine Company into the game preserve. While Dan and Jim struggle to remain loyal to those closest to them and respect each other's opinions, two newcomers to town are adding fuel to the fire - Mr Maypenny's long lost nephew and a social activist who wants to stop the expansion. The Bob-Whites struggle to maintain a united front and Trixie and Honey investigate some strange incidences in the game preserve and the odd behaviour of Mr Maypenny. By solving the mystery, they contribute to a solution that everyone is happy with and reunites the town. David Maypenny alias Lawrence Howard - Mr Maypenny's "nephew"
Chair of the town council members and several concerned citizens. Lawrence Howard - he impersonates Mr Maypenny's nephew to try and get Mr Maypenny to give him power of attorney, which would allow him to sell his land. He also poisoned ducks and planted them so they could be found easily to make Mr Maypenny appear incompetent. The book commences in later August/early September. Di is away on a late vacation with her parents and won't be back for two weeks. 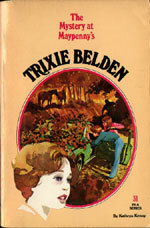 She visited Wisconsin and Minnesota and when she returns it is September and she tells Trixie she has missed three weeks of school (p. 84). Dan is in Brian's Social Studies class (p. 54). Does this mean that he is the same age as Brian? Honey rides Strawberry on several occasions in this book without any mention of Lady, her usual steed. This is the second occasion that the International Pine Company has been mentioned. In the beginning of #16 The Mystery of the Missing Heiress, the Bob-Whites discovered that the company was going to build on the marshland that was owned by Jim's aunt. And this is the third occasion that an impostor has impersonated a relative of the Bob-Whites or someone they know. Seems like a great plot device!